Inspired by a sermon from our church in Ohio, Mark decided he wanted to put away the computer, turn off the TV and get back to living simply. 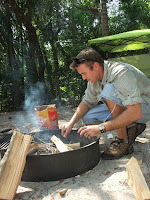 Insert, an impromptu camping in SW Florida. 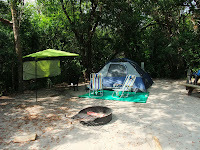 Two hours west of Miami lies the Collier-Seminole State Park. Mark organized us a drive up campsite and although we weren’t backpacking, I insisted we “rough” it as much as we could. 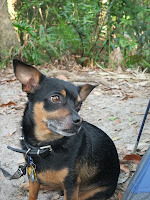 We packed up our spanking new camping gear, the bare essentials of food and clothing and the pups and headed west. Unfortunately it wasn’t as picturesque as we had planned. Our assigned campsite was infested by wasp. I panicked (I have a history with yellow jackets), refusing to move anywhere near the flying spawns of Satan, which meant Mark was left with heavy lifting. After a lot of work and even more sweat, our tent was up and a fire was started. Surprisingly, we didn't take into account that spring in the swamp brings out bugs. With the wasp and the increasing number of brown flies, Mark decided to make a trip to the ranger station for more fire wood and a quick pass by the gas station near to pick up bug spray. The ranger told us we could move campsites. Luckily, the site next to us was open and wasp-free. A few trips back and forth we were once again ready to relax. We literally puddled sitting in front of our tent. 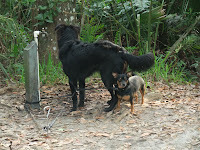 The dogs were constantly getting tangled up. I didn’t bring any long pants because it’s effing hot in Florida; thought it would have been nice to be protected from the ‘squitos. A veggie burger fell into the fire. Half the campsite was rented to a Cuban family reunion, and if you didn't know Cubans are loud: loud talking, loud music blaring (Christina Aguilera, the Spanish version), lots of people and a huge pig turning over a spit. The night cooled off a bit, and lucky the campsites had restrooms with showers. After an ice cold shower we were able to jump into the tent. We just started relaxing, when Morgan gave a warning bark. The yacht captain in Mark sprung into action, flicking on his flashlight on a raccoon scouring our campsite (the bandit was actually really cute and really clean. I kept wondering how he was so clean and I had to scrub the dirt off me after camping for only half a day). In the morning, Mark attempted to make me fresh coffee. Unfortunately the press didn't work and the coffee ended up more like silt water. We called it quits, packed up quickly and went on a hunt for anyplace that had decent coffee. We did spend the rest of the afternoon at the dog beach then drove back to Miami. On another note, this past weekend marked three years together for Mark and me. I didn't realize it until Monday night (See how romantic I am?). 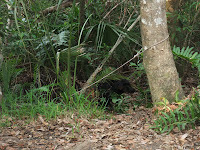 But it’s actually quite fitting we had a disastrous camping trip … after all everything we’ve done has never been easy. Miss you bunches and BUNCHES!! !